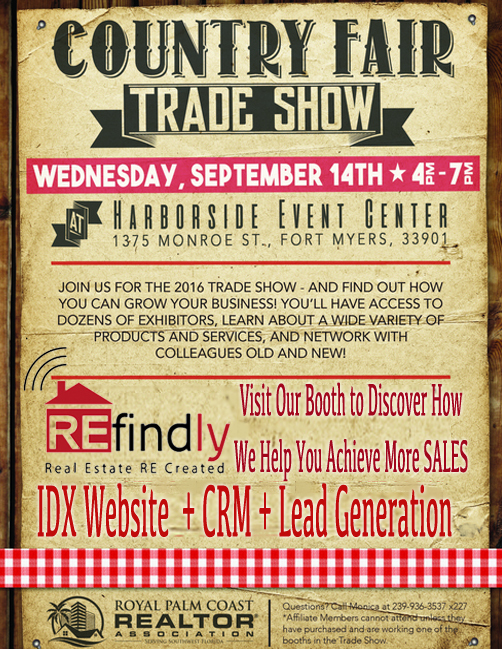 Remarkable real estate technology created by Southwest Florida’s own REfindly will be demonstrated for attendants at the 2016 Country Fair Tradeshow hosted by the Royal Palm Coast Realtor Association. If you are a broker, team leader or independent agent, you’ll definitely want to learn how this real estate technology helps you to capture more leads, more efficiently manage leads, and save time, money and headache, so that you can better focus on what matters most – SALES!! The real estate technology developed by REfindly combines an IDX-enhanced website, dynamic CRM and lead generation services which collectively help to broaden your exposure to potential customers, more conveniently communicate and manage your business operations, and ultimately do more by working smarter, not harder. If you’re attending the Royal Palm Coast Realtor Association Trade Show at Harborside Convention Center in Fort Myers, visit with the team from REfindly to see this real estate technology in action. In addition to earning regional and national awards for technological innovation and customer service, REfindly has been recognized among the Top Real Estate Service Providers in North America. As always, we look forward to meeting existing clients as well as potential new clients during this year’s trade show!